What's your fondest memory of your grandmother? What was your childhood like? Have you always lived in India? (hope that is not to personal) just curious. TeacherAngel wrote: What's your fondest memory of your grandmother? 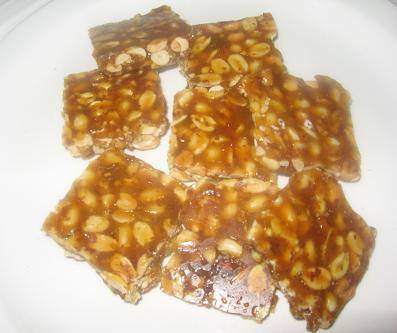 My grandma used to bring us "chikki" (sweet food made up of peanut and jaggery. I remember she fought with grandpa to go out so that she can buy it for us. WorkAtHomeGal wrote: What was your childhood like? Have you always lived in India? (hope that is not to personal) just curious. My father stayed in India. He had chance to shift to either one of from - Japan or Germany. But he decided to stay here. I spent all my childhood and 20s in this country. My childhood was good, like most of kids in 90s. Peaceful tier-2 level city where we lived. Enjoyed country life during vacation. Wow! We also have that here in the Philippines, specifically in our province. We call that "bandi". I think it has to be mango. Specifically the "Alphonso" one that we have here in local place. We have nice mango here in the Philippines too. It is the pride of a province here called "Guimaras". TeacherAngel wrote: We have nice mango here in the Philippines too. It is the pride of a province here called "Guimaras". Here in India we have one sweet dish known as "Kaju katli". [quote="TeacherAngel"]We have nice mango here in the Philippines too. It is the pride of a province here called "Guimaras". I looked it up, made of cashew, right? It looks like a cross between tofu and rice cakes, though. It looks delicious especially with what looks like herbs. Are you familiar with MIRC? What do you mean by SME? Do you have your own family? skysnap wrote: Ask me anything you want. Day job: Works as QA Associate for SME. That is great! Some of my Friends are doing QTP/ UFT with HP Load Runner(earlier Mercury). Any career advice to people who want to develop their career in Manual or Automation Testing, as some of my friends want to do?